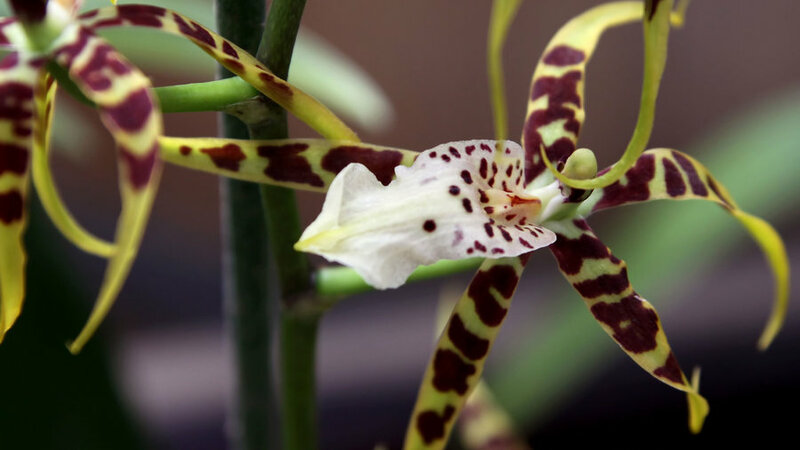 These epiphytic orchids boast graceful, pendant spikes with many closely set, fragrant, waxy flowers. Water copiously in spring and summer, not so much the rest of the year. Grow in bright light. 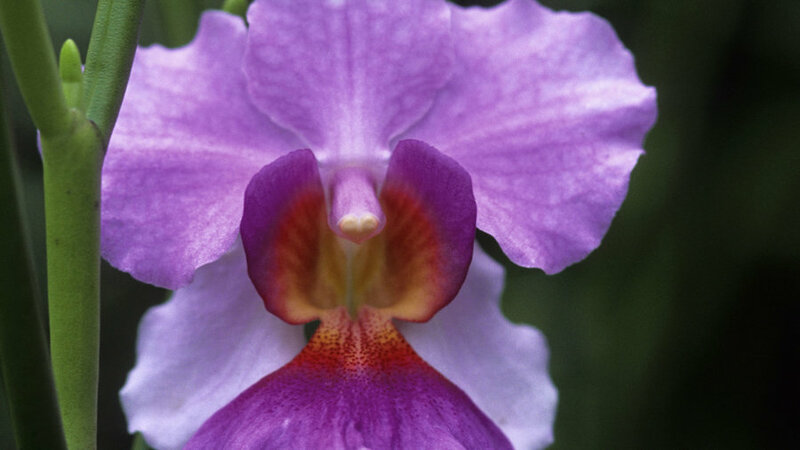 These orchids offer fantastic winter color. These epiphytes have star-like white or greenish white flowers with long curved spurs. Keep moist all year except in fall; then allow plants to dry out between waterings. Grow in bright light. This remarkable group of terrestrial orchids with large spoon-shaped leaves produces dramatic tulip-like flowers in summer. Plants prefer cooler temperatures—around 50°—at night. Protect them from summer sun or the leaves will scorch, but give them some winter light. When growth has matured (generally in December or January), allow them a 4- to 5-week rest with only occasional misting. 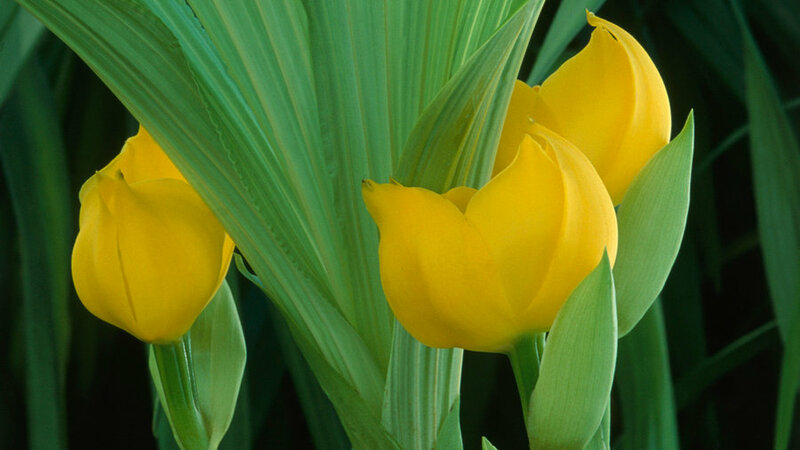 Once bud spikes appear at the base of the bulbs, you may resume watering. 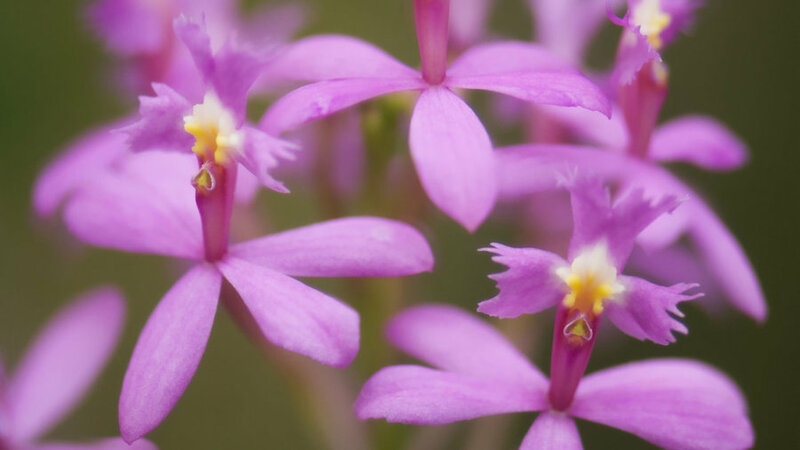 This small group of epiphytic orchids has feather leaves and short spikes of small flowers, often 50 to a stem! It flowers in early spring and summer. Grow in sun and keep evenly moist. These Brazilian epiphytes have large showy flowers and dark green leathery leaves. Grow in sun or bright light, and rest plants without water for about a month after they bloom. These large epiphytic orchids have evergreen leaves arising from plump pseudobulbs. Flower spikes are generally elongated and pendant, carrying many fragrant flowers with long slender petals and sepals. These plants are sun lovers, needing temps above 60° and moisture all year. This group contains more than 150 epiphytic species with dark green, spoon-shaped leaves that are handsome even when not in bloom. Flowers are generally small in shades of brown, cream, beige, or green. Plants prefer a shady location. Excess water left standing among the leaves will cause the buds to rot. 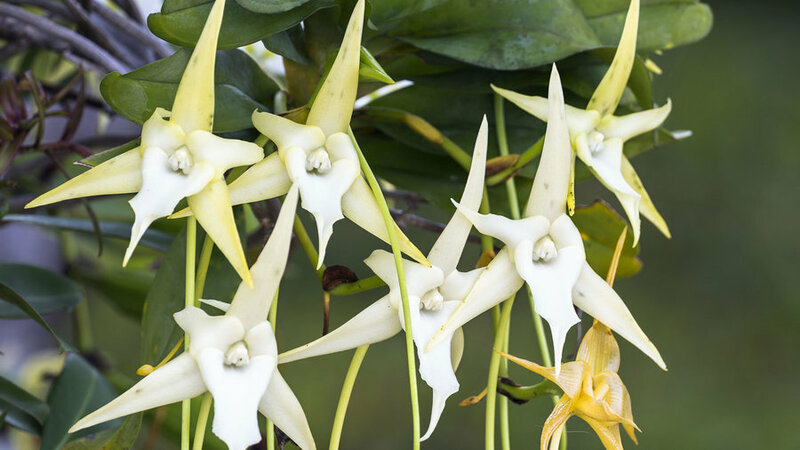 These are generally known as swan orchids because of the graceful curve of one of the flower parts. Plants are epiphytic, with leaves and flower spikes arising from the tops of pseudobulbs. Leaves are usually deciduous although the time of year for this is variable. After new growth is completed, plants need a definite rest period for several weeks. Grow them in a brightly lit location. Flowers usually appear in summer. 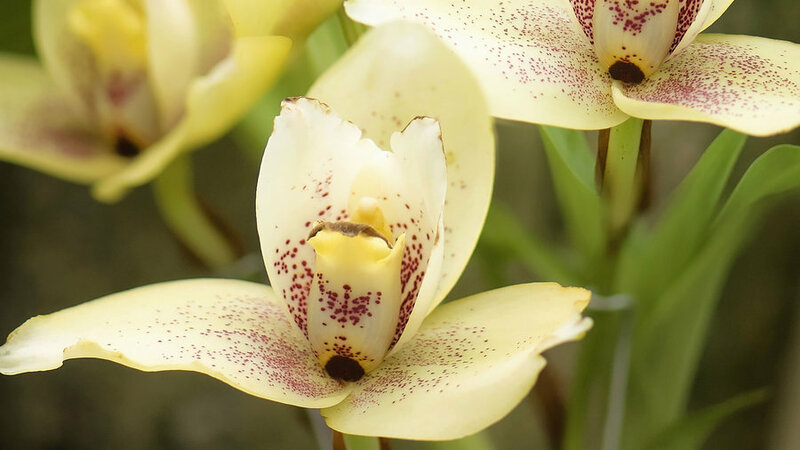 Graceful plants with lavish blooms, cymbidiums are happy wherever nighttime temps fall to 60 or lower during the warmest parts of the year. From long, narrow, arching foliage arises arching spikes of flowers, usually from February to early May. 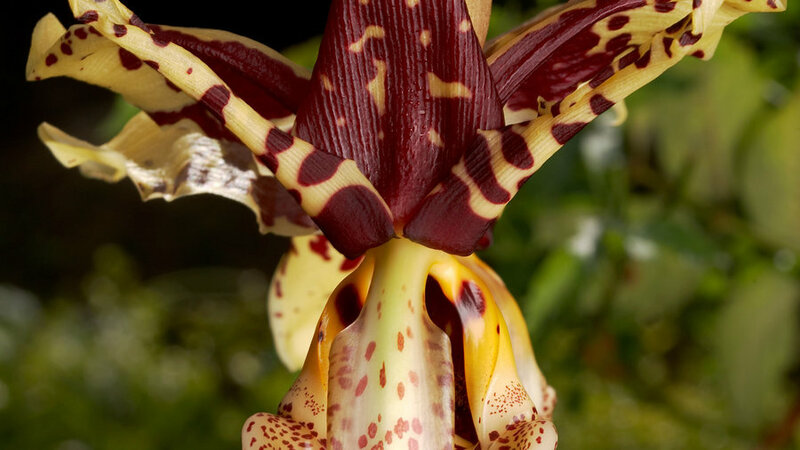 One spike may carry as many as 30 flowers, each 4 to 5 inches across, which can remain fresh for 8 or more weeks. From March to October—the months in which new growth develops and matures—water plants copiously. At other times, keep the potting mix barely moist but never dry. 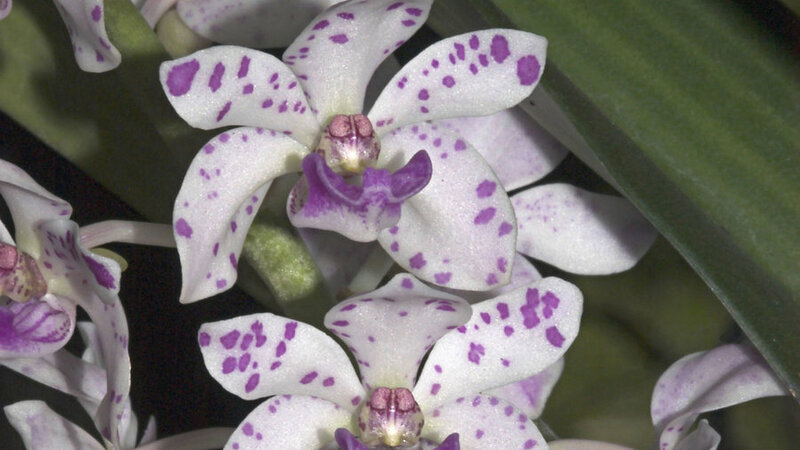 Pseudobulb dendrobiums: Need abundant watering until leaves mature. Then, to encourage budding, rest the plants for a month without water. After flowering has finished, allow another complete dry rest for about 8 weeks. Give these plants a sunny place. Evergreen cane types: Flesh leaves and pendant bunches of flowers. Water copiously all year except immediately after flowering when a rest period for about a month is necessary. Give the plants plenty of sun. In late fall, place them where they will have cool nights (55°) to encourage budding. Deciduous cane types: Flowers appear on nodes along the top of bare canes. In most species, plants are not truly deciduous and retain some leaves at all times. 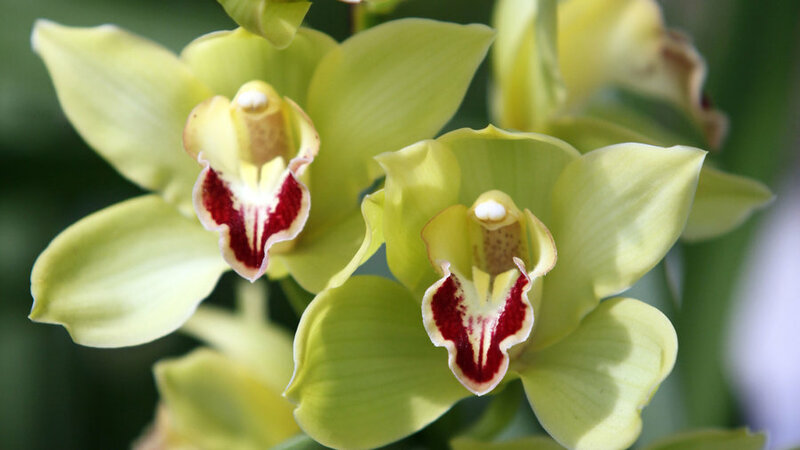 In summer, these orchids need abundant moisture and warmth, but when foliage is mature (a solitary leaf instead of a pair of leaves) stop watering for 6 to 8 weeks to encourage formation of flower buds. Move plant to a sunny, cool location (45°­–55°) while leaves fall. When flower buds start to show nodes of canes, move plants back to warmth to resume watering. Evergreen phalaenopsis types: These resent fluctuating temps and need moisture all year with only a slight reduction of water during the period between maturation of new growth and the formation of flower spikes. The plants also require full sun and ample warmth. 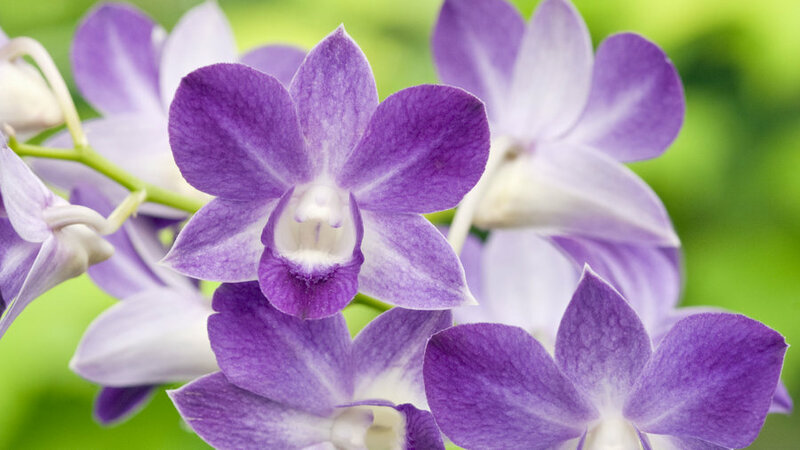 These are the most demanding dendrobiums but are well worth the extra effort needed to grow them. Black hairy-stemmed types: These have white spring flowers that will last for two months. Plants need even moisture all year, along with full sun and warmth. These are terrestrial and epiphytic orchids variable in flower form and plant habit. Some have pseudobulbs and need a decided rest after flowering, while others have cane growth and require moisture all year. Flowers come in many different colors and plants are generally easy to grow. Most need sun and warmth. Closely related to cattleyas, these epiphytic orchids have one or two evergreen leaves at the tops of the pseudobulbs. Flowers resemble cattleyas but are usually smaller and have narrower petals. They should receive plenty of bright light for best flowering. After flowering and until new growth appears, laelias need very little water. During the rest of the year, they should be allowed to dry out between waterings. 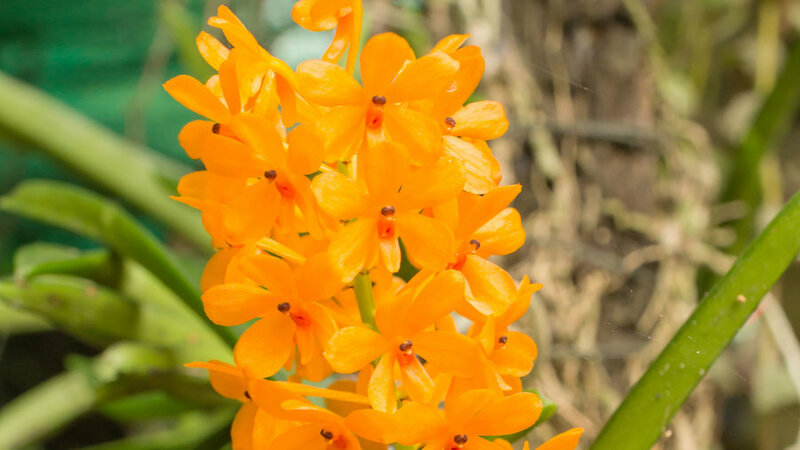 These deciduous or semi-deciduous orchids are usually epiphytic. The long-lasting flowers are predominantly green, although some are pink, white, yellow, or brown. They thrive in a cool location (50°–55° at night, 10 degrees higher during the day) with good light but not direct sun. Potting mixture should be well-drained and constantly moist except for a period after flowering when water should be reduced to a minimum until new growth appears. The epiphytic miltonias are called pansy orchids because they bear flat-faced open flowers that resemble pansies in shape and markings. They have long, graceful light green leaves that will produce a clump of foliage a foot or more in diameter. Some species prefer coolness, while others need warmth. The cool types have white or pink flowers overlaid with magenta, crimson, or yellow. The warm growers bear yellow or white flowers marked purple or brown. All require moderate light and no direct sun. 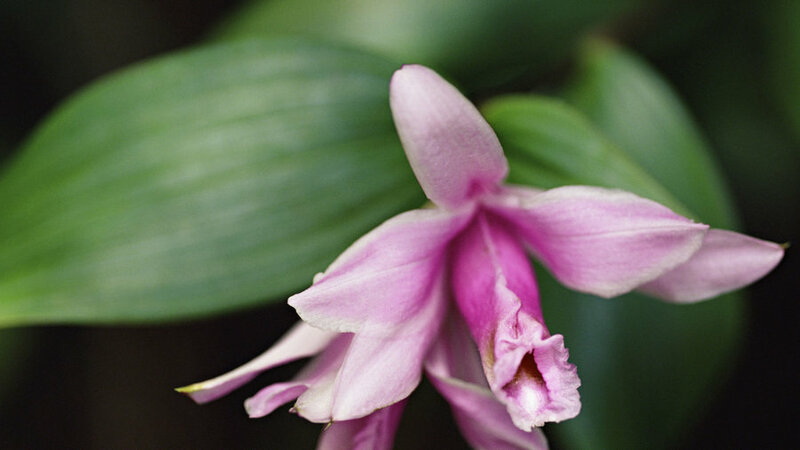 Delicate colors and ruffled flower parts characterize the blooms of these epiphytic orchids. Most species prefer very cool conditions, since native habitats are in foggy regions at high altitudes in the Andes Mountains. Night temps around 50° and daytime ones of low to mid-70s are ideal. Especially in summer, keep day temps as low as possible—below 80° if you can. Transplant after flowering in fall or in early spring but never in hot summer weather. Plants thrive under crowded conditions, so use relatively small pots for the size of the plant. Odontoglossums prefer plenty of light (as long the heat is low) but no direct sun and require little watering throughout the year. 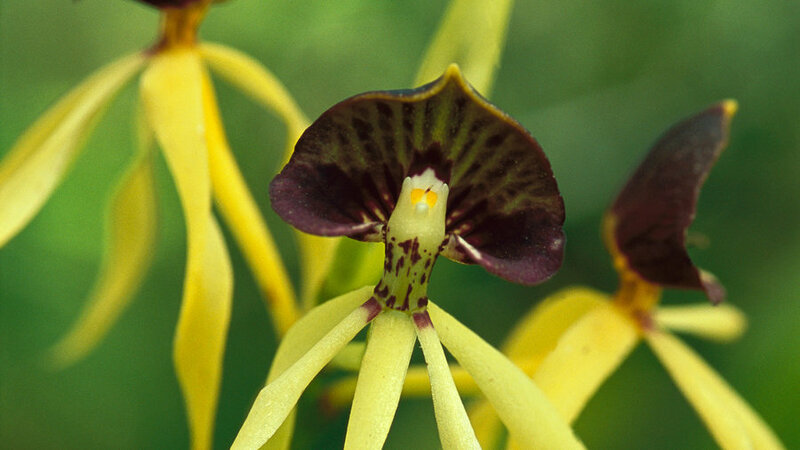 A large group of epiphytic orchids, most of these produce long spikes of beautiful yellow flowers with various markings. These are sun lovers, so a western or southern exposure suits them well. Ideal temps correspond to average home conditions. These plants like to dry out thoroughly between waterings. In winter, keep plants just barely moist, but not so dry that the pseudobulbs shrivel. Whenever you water, flood pots until excess water runs out the bottoms. 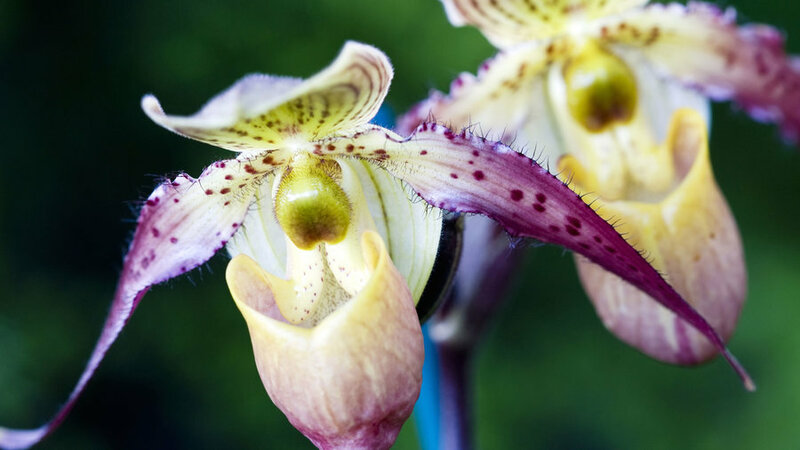 Named for their pouch, lady’s slippers (Paphiopedilum—paph, for short) boast pouch-like blooms from winter through spring. Lady’s slippers need more water than the others on this list. The exact amount varies on whether you pot your orchid in sphagnum moss (less often) or large bark (more often). But still be careful not to overwater roots. Lift the container up before and after watering to get a sense of its weight when it’s dry. And when in doubt, wait a day. While they need more water than the others, paphs require less light. An east-facing window is ideal. Reddish leaves are a sign of too much light. Err on the side of too little while you’re figuring out your paph’s preferences. Lady’s slippers will be happy in your home (60-65º at night and 75-85º during the day). Remember that temperatures next to windows fluctuate more than the rest of your house. 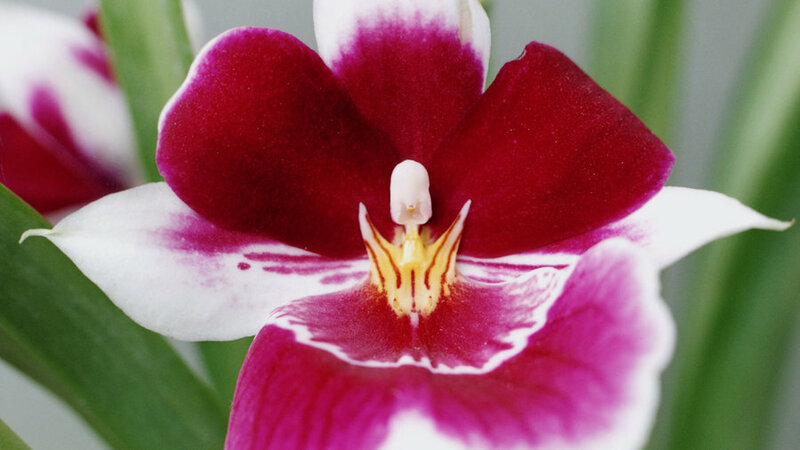 The name “moth orchid” gives you an idea of the delicacy and grace that characterize this group. An east-facing window that gets morning light is ideal. South- or west-facing windows work, too, but be sure your orchid is shielded from the brightest (and harshest) of afternoon sun with a sheer curtain. The leaves should be a bright shade of olive green. Darker leaves mean the plant is not getting enough light; red-tinged leaves mean there’s too much exposure to light. A once-weekly lukewarm watering is usually enough for Phalaenopsis. You might need to be a little more frequent in summer, and less so in winter. When in doubt, give it another day. 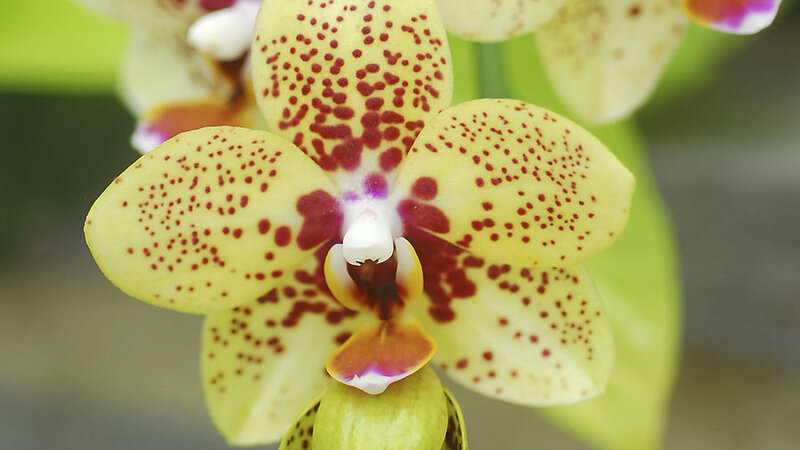 Phalaenopsis are happy in temps above 60º at night and between 70º and 80º during the day. Fluctuating temperatures can cause buds to drop off right before they open. 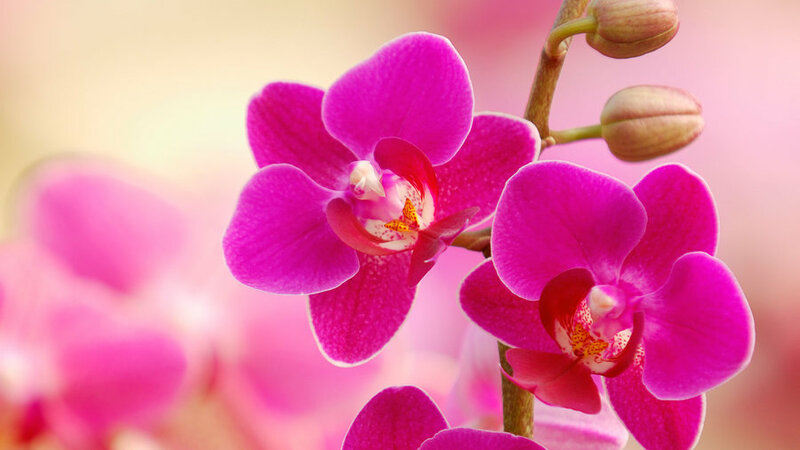 Increase humidity slightly for Phalaenopsis by placing the containers on trays of gravel, filled partially with water. Plants still need circulation and should not sit in standing water. When flowers fade, you have two choices: Cut the spike down to the leaves and the plant will grow a strong stem with even larger flowers within a year. Or you can cut stem just above the first node (it looks like a bump) below the lowest faded bloom. Often the remaining stem will produce another round of flowers within 8 to 12 weeks. 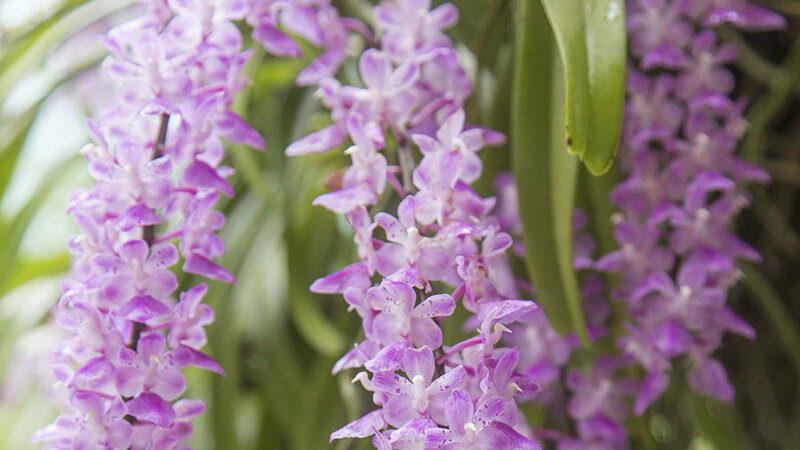 These epiphytic orchids have small colorful flowers tightly packed on long pendant stems, giving rise to their common name, foxtail orchid. Foliage is leathery, strap-like, and grows in a fan shape. Plants resent being disturbed when replanting is necessary. At that time, try to remove as much old potting mix as you can without removing the plant from its container; then gently lift around the roots with fresh material. 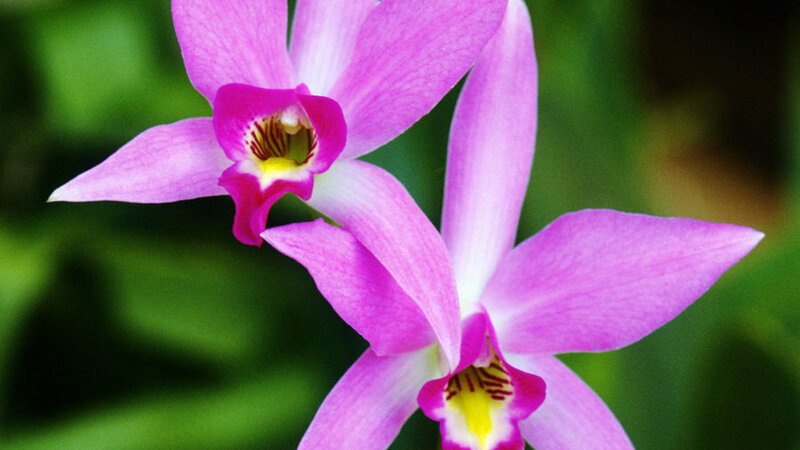 Terrestrial orchids, these bear large, showy cattleya-like flowers in summer. Give them a sunny location and ample moisture all year, especially in early spring, but decrease the amount for a month after each year’s new leafy stems are fully developed. Only mature plants will bear flowers, and by that time, plants are often 5 to 6 feet tall. 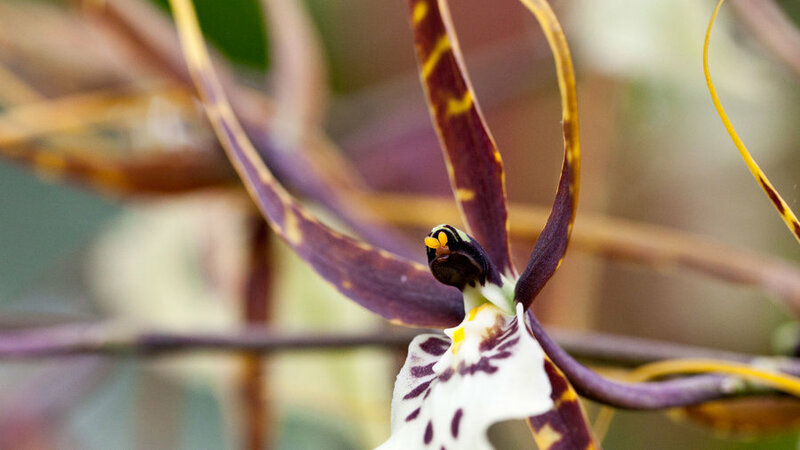 These epiphytic orchids bear large flowers in bright color combos, each of which only lasts a few days. Because flowers appear on pendant scapes that frequently grow down through the potting mix, a hanging basket is necessary. Plants need some sun and copious water during growth, not so much moisture during the rest of the year, but never let them dry out completely. Most species are highly fragrant. They require shade from direct sunlight.